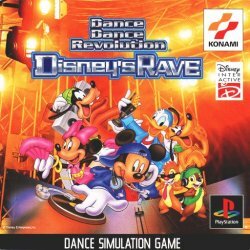 This second U.S. release in the Dance Dance Revolution series features remixed versions of classic Disney songs, including the Mickey Mouse March, Chim Chim Cher-ee and Supercalifragilisticexpialidocious. 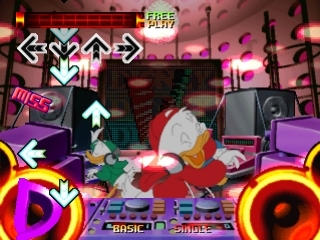 There is also a selection of non-Disney dance tunes, bringing the total number of songs to 20. 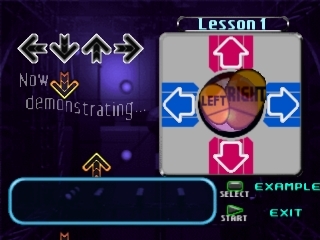 For beginners, there are lesson and training modes that let players get adjusted to basic concepts of DDR and practice specific songs. 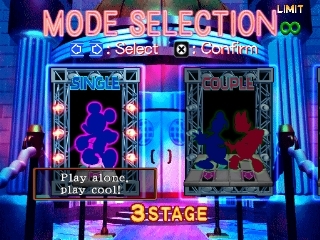 Exclusive to this version is the Dance Magic mode, in which players share a dance meter that shifts between from one performer to another depending on how well they are doing. Whoever has a larger portion of the meter at the end of the round is the winner. 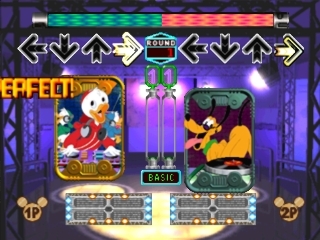 Dance combos fill up the combo meter, which releases "dance magic" when full. This magic does damage to your opponent such as inserting random steps or speeding up their arrows. 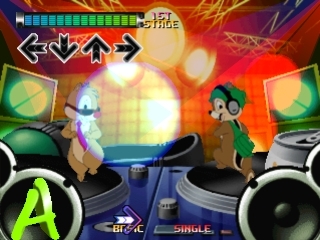 Although based on the Japanese Dance Dance Revolution: Disney's Rave, the U.S. version features several changes and additions for the American audience. 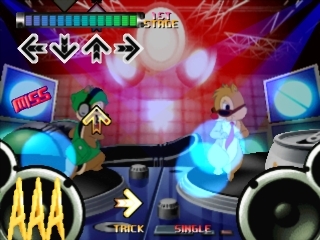 Disney's Rave featured an assortment of American songs like Surfin' U.S.A. and Macarena, but most of these have been replaced by tunes from previous Japanese installments of DDR, such as Share My Love and Higher. 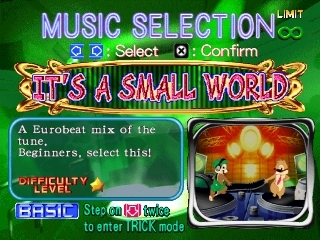 A third level of difficulty, Maniac mode, has also been added, and can be unlocked by passing every song in Trick mode. 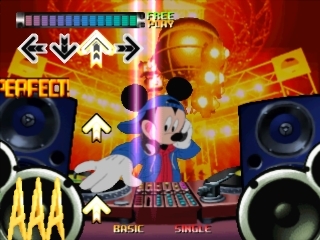 Dance Dance Revolution: Disney Mix gets you out on the floor as one of your favorite Disney characters dancing to a Disney soundtrack that'll make you move. 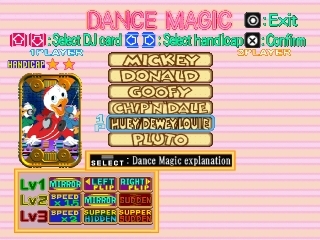 Choose to groove as Mickey, Donald, Goofy, and more. 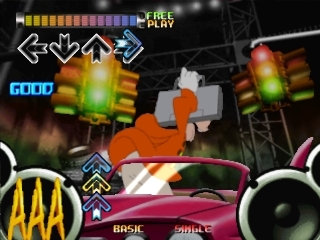 All you have to do is press the directional buttons on your controller or on the dance floor pad that correspond to the onscreen arrows. Sound easy? 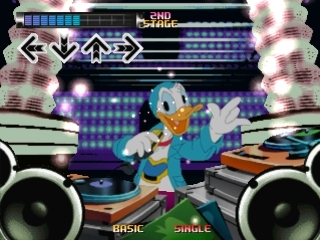 Just wait until the beat picks up and the commands get complicated. 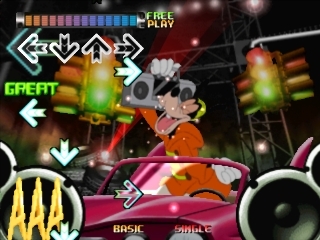 It's a fun, high-energy workout built on dynamic choreography, up-tempo music, and nonviolent gameplay, and it features a variety of gameplay modes. 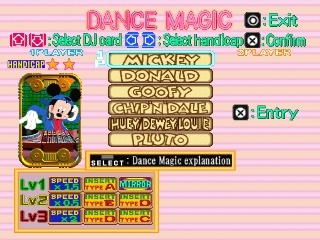 The revolution continues with Dance Dance Revolution Disney Mix. 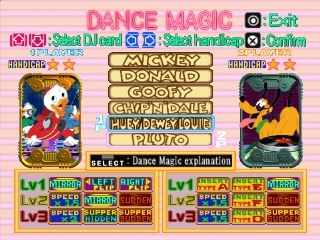 Featuring your favorite Disney characters and dance mixes of popular Disney tunes, this is the hottest dancing game this side of the Magic Kingdom. 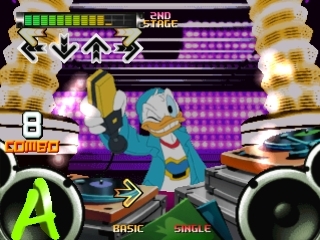 Get ready to beat up the dance floor and put your skills to the test as you move to the groove. 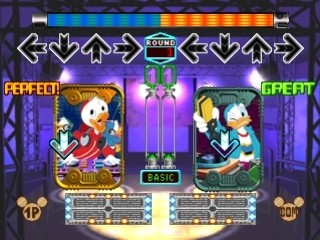 Let Mickey and his friends make your dreams come true as you become a star. 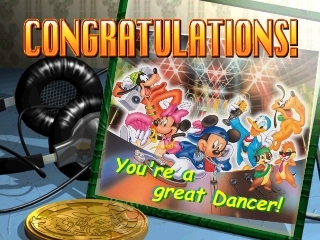 * Select from your favorite Disney characters, including Mickey Mouse, Donald Duck, Goofy and more! 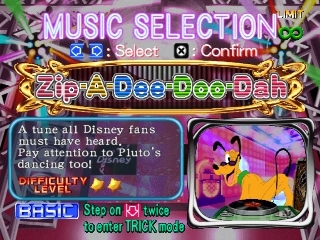 * Dance to high-energy remixes of popular Disney tunes, including It's A Small World, Zip-A-Dee-Doo-Dah, and Mickey Mouse March. 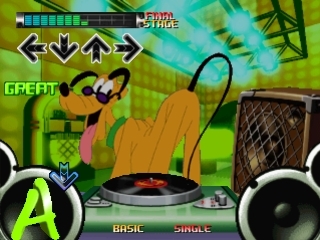 * Re-create the DDR experience with Konami's DDR controller (sold separately). * Special Work Out features let you have fun getting in shape – while tracking the calories you burn. 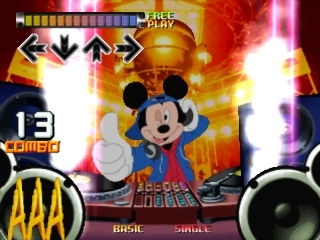 * Multiple difficulty settings makes DDR Disney Mix easy to learn for all ages. Dim. - 512 x 512 pix. Dim. - 654 x 512 pix.